“Americans are untrustworthy and illogical. 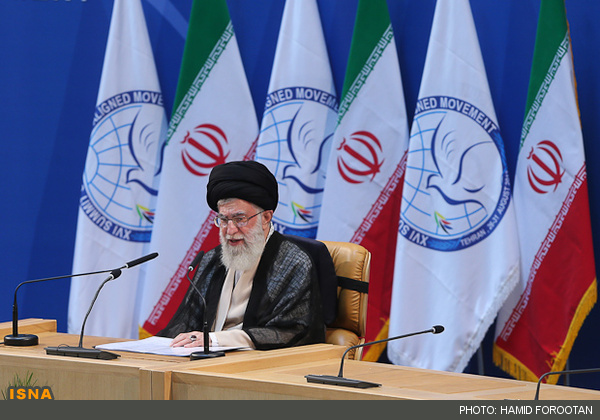 They are not honest in their dealings,” Khamenei added. “We’ve always believed and continue to believe in interaction with the world but the important point is to understand the other party and determine its goals and tactics, because we will be tripped up if we don’t understand them correctly,” Khamenei said. “The art in interaction with the world is to continue your path without the other party being able to stop you. If interaction with the world causes retreat from the path, it is a loss,” he added. Of course Khamenei is entitled to his opinion. But the interesting thing about his speech was that he was publicly saying that the ‘art’ of interaction/negotiation is to just engage in talks but continue with one's own policy. Such proclamation by the country’s leader in a policy speech is amazing, especially when discussed in the context of untrustworthiness. Even an ADD child on Ritalin knows that as long as Zionists have total control over the paranoid US stasi failed state there is less than zero chance of any improvement of relations with Iran. Zionists are in the desperate end game in the region as US is imploding and the "Arab Spring" is having unintended and unforeseeable consequences. The region is heading towards a major conflagration and at least another 2 decades of destabilization. The whole area will look different in about a decade and the US will be total third world deadbeat by then. What happened to the notion of compromising for the sake of the entire nation and not be so hard-headed. Political Islam of cannibals, child killers, rapists and murderers of minorities, paid to fight in Syria by the USA, is dying. That sort of "sh!t" as you put it, is a Saudi thing supported by the USA. It is not Iranian and has nothing to do with Iran. Supreme Leader Khamenei, is not only etitled to his opinion, but he is correct in his description that they (West, Americans) are not honest in their dealings.